How To Customize Default WordPress Login Page? I think you got bored with your WordPress Login Page because there is nothing new. The boring fields, boring text colours, same logo, and boring button. You have to use this same to log in your admin panel every day when you want to log in your account. Seeing the same page every time is so boring, isn’t it? if I say that you can change or customize your WordPress admin login page. You can change fonts, logo, background colour, fields background, and also button. In simple words, you can fully change your WordPress Admin login page as I did for my WordPress Admin login page. So today I am going to teach you to customize your default WordPress Admin login page. I hope you’ve successfully installed this plugin. Now you can go to customize your WordPress Admin plugin. Go to Appearance>Login Customizer. Now you will see plugin setting page which is not complicated, very simple and very easy to understand. There is one single button which is named Start Customizing. Click on it to customize your Login Page. After click that button you will be land on Customization page of your theme. 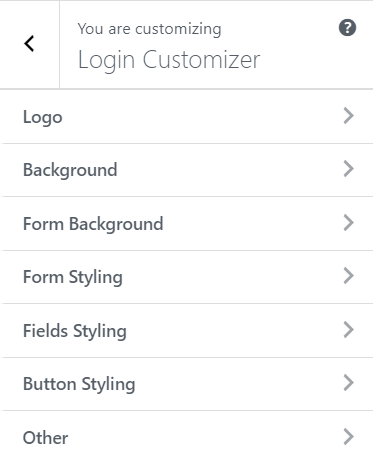 There you have to find Login Customizer tab and click on that. This is the screen which you have to take care. Here you can see the Logo, Background, Form Background, Form Styling, Feild Styling, Button Styling and other tabs. First Tab: Click on the Logo tab to change the default WordPress logo to any your custom logo. Here you can use your website logo. It will show above the Login form. Choose a login logo from your file manager by clicking the select image button. Then change the Logo width, heigh, and Padding button. if you don’t have any knowledge about it you can leave it to defaults value. Second Tab: Now its time for the second tab which is Background. Here you have to select a background image which will be the background of your WordPress Login page. If you don’t want any image as your background so you can choose and color. And the last field is for the background size. I recommend to leave it blank. Third Tab: In the third tab, you can change the form background. You can choose an image to show as the background of the form, it won’t be shown in full screen, it will be shown as form background. Forth & Fifth Tab: Forth tab is all about the form styling where you can choose the width, height, padding, and the border of the Login form. and Fifth tab is about fields styling where you can customize your fields. You can change Input Field Width, margin field background color, field color, and label color. Sixth Tab: This tab is for customizing Log in button. In this tab, you can change button background, border, hover background, hover border, and box shadow. Seventh Tab: Seventh Tab is containing some other function. You have seen the link to Register, Lost Password, and back to your site. In this tab, you can change the color and hover color of these links. And in the last box, you can add custom CSS. Use this if you know otherwise leave it blank. I Found Your Article very useful for me . Thanks for sharing your great knowledge here. Really useful and helpful article. Hello sir, Very good post of your.Thank you for sharing this information with us. Keep up the good work.!! Thanks Sir Nice Article And Do U Tell me Which is Best Advertising Program in Internet. Thanks for a wonderfull post .It is very well explained.Keep sharing. Thanks, Rahul And Keep Visiting!